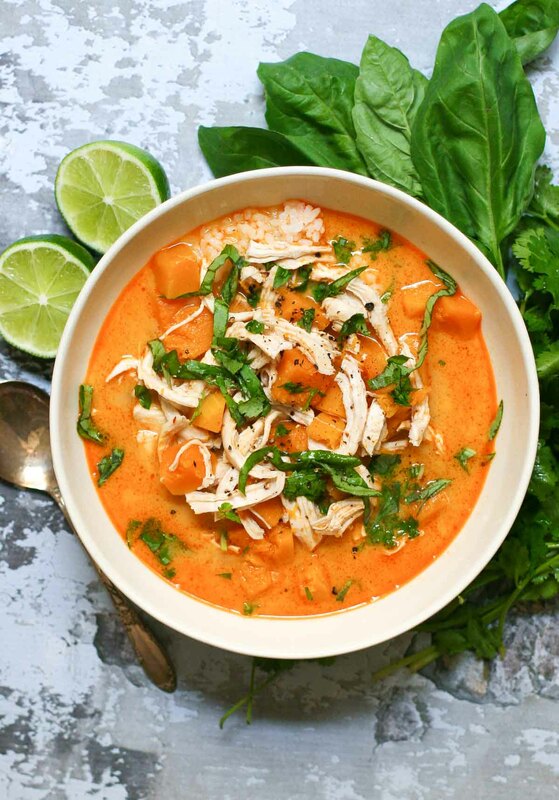 Thai curry is one of the most comforting, warming dishes you can make. 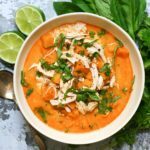 The spicy chile and herbs are balanced by the creamy cooling coconut milk, and when spooned over tender white rice, you’ve got one of my favorite meals in bowl. Red curry paste, the variety used in this recipe, is made with dried red chiles, garlic, shallot, lemongrass, salt, galangal (a type of Thai ginger), kaffir lime, and sometimes shrimp paste. Green curry contains basically the same ingredients, except it uses green chiles instead of red, plus a pop of coriander, cumin, and turmeric. If you’re looking for a green curry recipe, I’ve got an excellent one here. Yellow curry is the most mild and is actually vegetarian! It leads with a strong lemongrass flavor, and doesn’t use any shrimp paste. Honestly, they are ALL delicious, but I thought the red paste would pair best with the sweet butternut squash I had sitting on my counter, so that’s where this recipe went! Curries are SUPER simple to make if you’re using jarred curry paste. Simply sauté the paste in some oil, add some veggies, coconut milk, and protein of your choice, and let it simmer. Top it off with fresh lime juice & herbs, and you’ve got a delicious meal ready in no time. Honestly, if you use pre-cooked chicken, chickpeas, or tofu, this meal would be ready in under 30 minutes. If you choose to poach some chicken first, it’ll take a little bit longer, but the whole thing will still be done in about an hour. The curry paste adds so so much flavor, that you can keep the rest of the ingredients pretty basic. 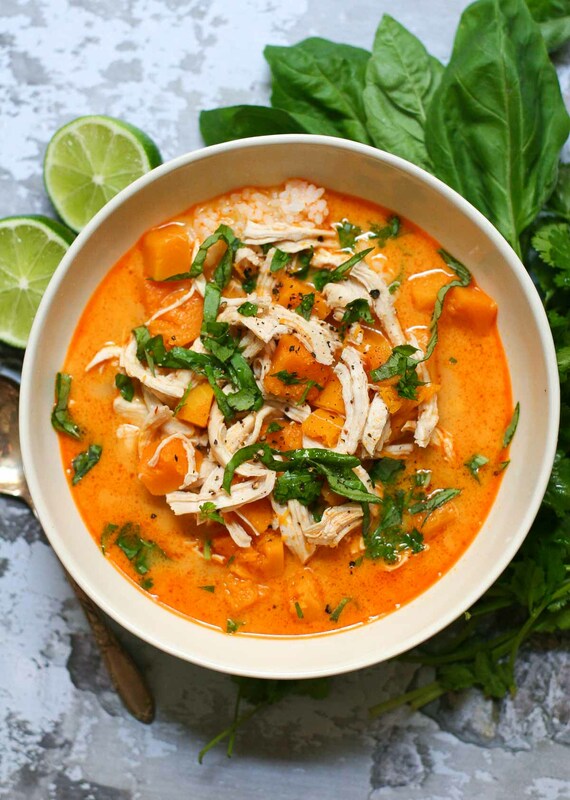 in fact, I really only used butternut squash and chicken in this recipe, and it was great! Feel free to experiment with whatever veggies you have in your fridge. Sweet potatoes, onions, or chickpeas would also be wonderful in this dish. Bring a large pot of water to a rolling boil. Add the chicken breasts, reduce the heat to a simmer, and let cook for about 20 minutes, or until the chicken reaches an internal temperature of 165 degrees Fahrenheit. [Exact time will vary, depending on the size of your chicken breasts.] When done, use tongs to remove the chicken to a plate & set aside to cool. Meanwhile, place the rice and 4 cups of water in a rice cooker or small lidded pot. Cook in the rice cooker or according to package instructions until done. Set aside for later. Once the chicken is cool enough to handle, use your fingers to shred it into bite sized pieces and set aside. Next, start the curry. In a large enameled cast iron dutch oven, heat the two tablespoons of canola oil over medium-high heat. Add the curry paste and butternut squash and cook for about 5 minutes, until fragrant. I used 4 tablespoons of the Thai Kitchen curry paste because it was somewhat bland... if you use a spicier brand like Mae Ploy, you'll probably only need 2 tablespoons. Add the coconut milk, fish sauce, and water to the dutch oven. Bring to a boil, then reduce to a simmer and cover. Let cook for about 15 minutes, or until the squash is tender. Once the squash is tender, stir in 1 teaspoon salt, 1 teaspoon ground black pepper, and 1 tablespoon soy sauce. Add the chicken and simmer for 5 minutes, until warmed through. Finally, turn off the heat and stir in the lime juice, basil, and cilantro. Add a scoop of white rice to each serving bowl, and spoon the warm curry over top. Enjoy! I’m a “stand up” chili kind of girl. 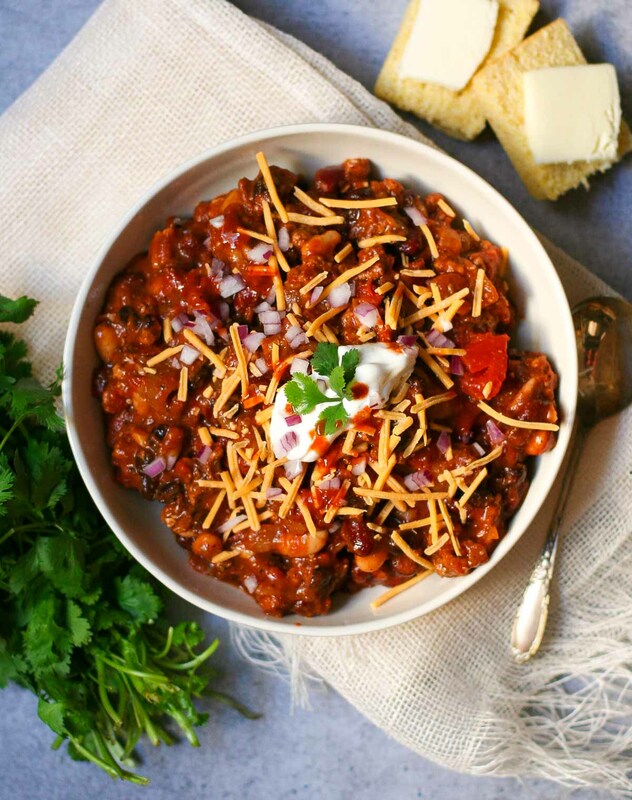 I like my chili thick and chunky, so that a fork or spoon stuck in the center would stand upright. Yeah, Dennison’s was my go-to chili as a kid, so it’s no surprise that I make my homemade chili in a similar fashion. 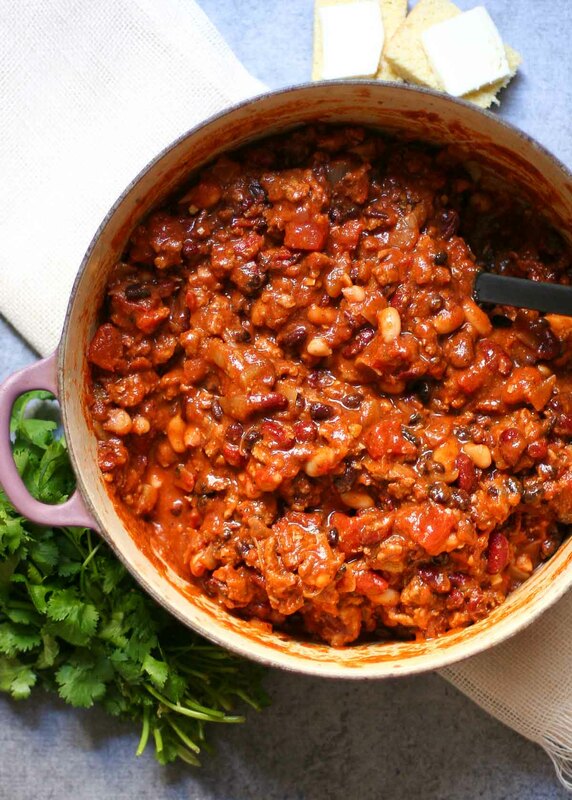 Chili can be made with many types of beans. Pinto beans, kidney beans, black beans, white beans, even garbanzo beans! Why pick one, when you can have THREE?? 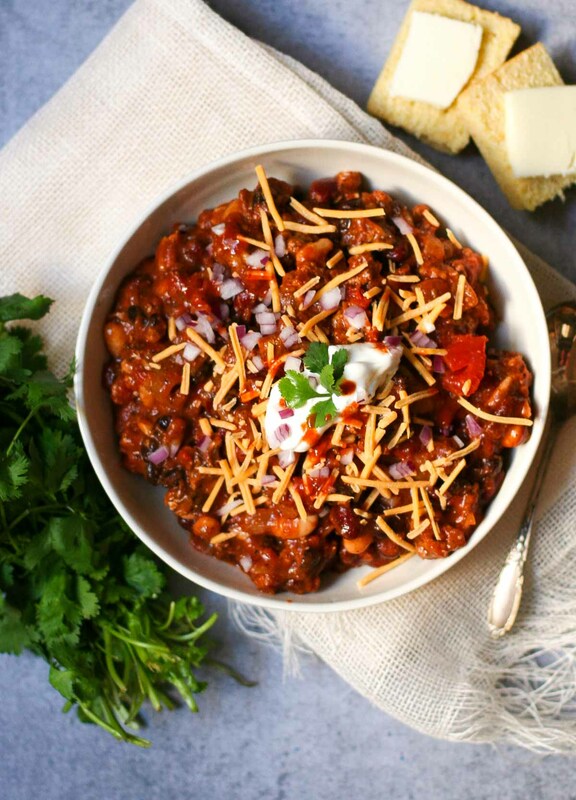 Kidney beans are my typical chili staple. I love their large size & creamy texture. But hey, the more the merrier, right? So for this recipe, I did 1/2 kidney beans, 1/4 black beans, and 1/4 cannellini beans. I also really prefer my chili with turkey, instead of beef. 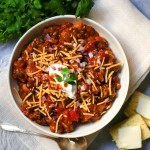 It has a little bit of a lighter taste, and remains in larger pieces, giving the chili a meatier texture. I present to you, the ultimate three bean turkey chili. 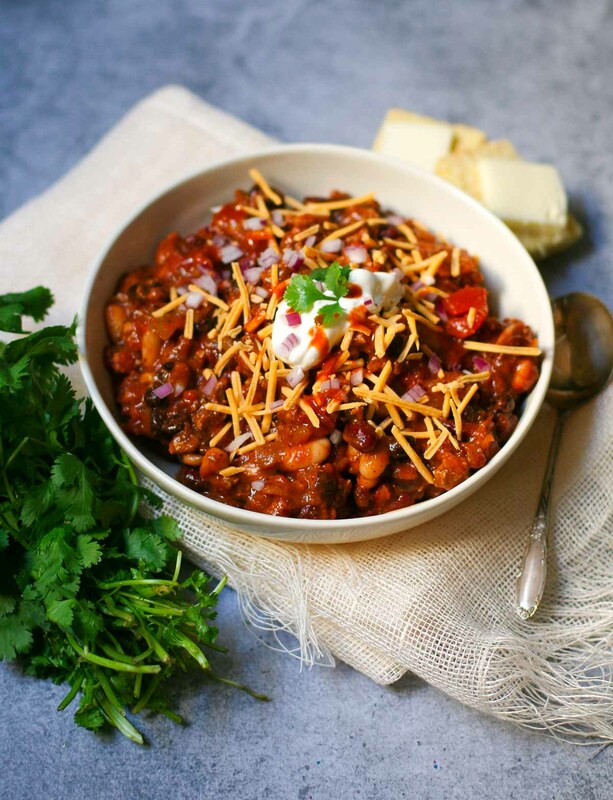 For real though, this chili takes almost no work. It’s ready in under 45 min from start to finish. Simply saute an onion, then brown the turkey & spices, add all the canned beans and tomato products, and simmer for just 5 minutes, and you’re done! And you can’t forget about the toppings. Extra sharp cheddar cheese, sour cream, cilantro, red or green onion, and a little hot sauce are my faves. Add a homemade cornbread muffin on the side, and you’re good to go. In a large enameled dutch oven, heat 2 tablespoons olive oil over medium-high heat. Add the diced onion, and sauté for about 10 minutes, until softened and just lightly golden. Next, add the garlic, turkey, cumin, coriander, paprika, chili powder, salt, and pepper to the dutch oven. Sauté, breaking up the turkey with a spatula, until the turkey is no longer pink, about 8 minutes. Add add three cans of beans, the diced tomatoes, tomato sauce, and tomato paste to the dutch oven. Bring to a simmer, and let cook for about 5 minutes or until heated through. 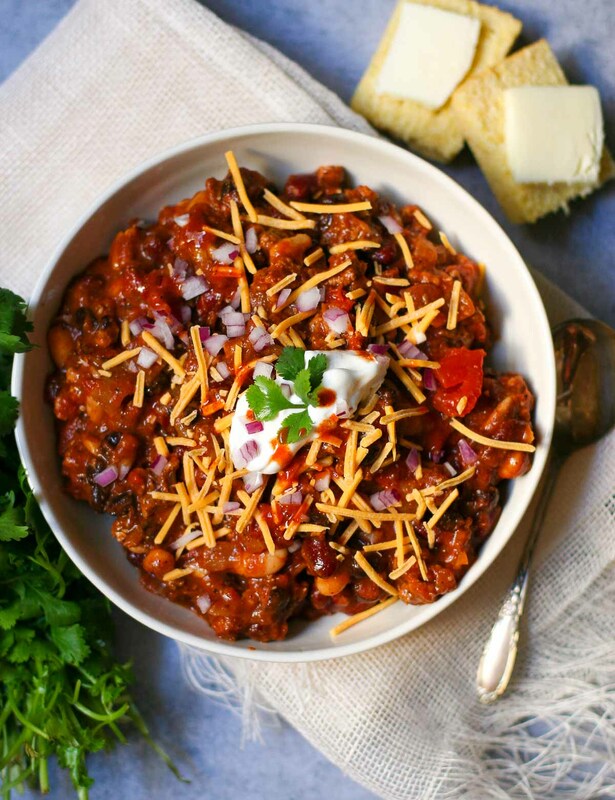 Spoon the chili into bowls & sprinkle with your desired toppings. Serve with cornbread on the side. This week’s Imperfect Produce delivery (which I’m obsessed with, by the way) included some lovely curly kale, creamy yellow potatoes, and small yellow onions. 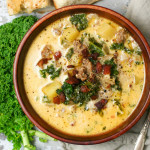 Duh, the first thing that popped into my mind was creamy kale and potato soup! 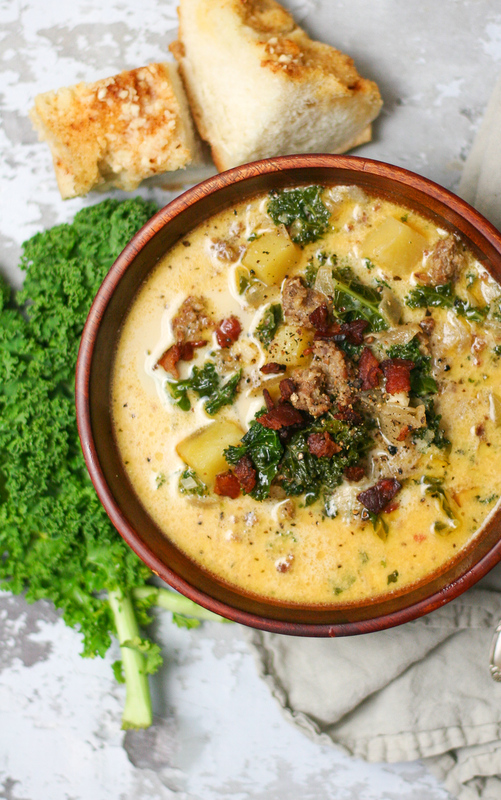 I mean, you can’t really go wrong with tender green kale, creamy potatoes, Italian sausage, and crumbly bacon bits. 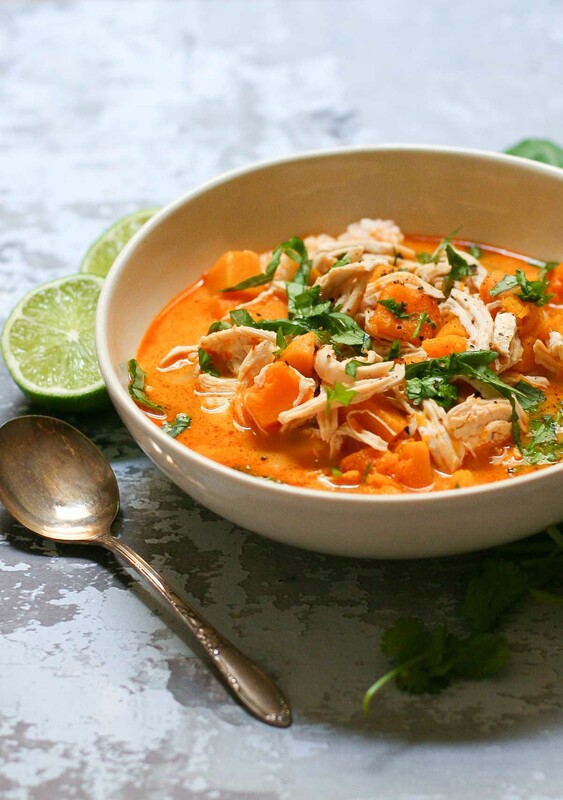 This soup is awesome because it uses relatively simple ingredients and doesn’t require a lot of effort. But it feeds a crowd & everyone loves it. All you have to do is chop up some bacon, onion, garlic, and kale, and the rest is simply cooking everything in one pot. I totally recommend serving this with some Herbed Garlic Bread on the side for soaking up that luscious broth. Add the diced bacon to a large enameled cast iron dutch oven. Cook over medium-high heat until nice and crispy, about 5 minutes. Remove the bacon from the pan with a slotted spoon and let cool on a paper-towel lined plate. Next, add the uncooked Italian sausage to the dutch oven. Use a spatula to break up the meat, and let it cook until well browned and broken up into small pieces, about 10 minutes. Use a slotted spoon to remove the sausage to a bowl, and set aside for later. Add the diced onion to the dutch oven, and let cook in the bacon/sausage fat until softened and just lightly golden, about 8 minutes. Add the garlic, salt, pepper, and oregano to the dutch oven and let cook for a minute or so until fragrant. Add the potatoes to the dutch oven and toss to combine with the onions and spices. Pour the chicken broth into the pot, increase the heat to high, and bring to a boil. Reduce the heat to a simmer & let cook for about 15 minutes, until the potatoes are tender. 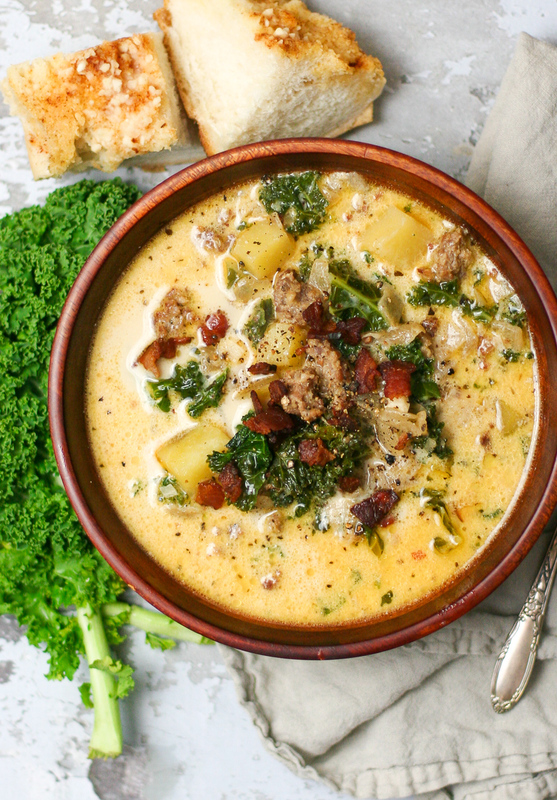 Once the potatoes are tender, stir the kale into the soup along with the reserved sausage. Let cook for just a few minutes, until the kale is tender. Add the half and half to the pot and bring to a simmer. 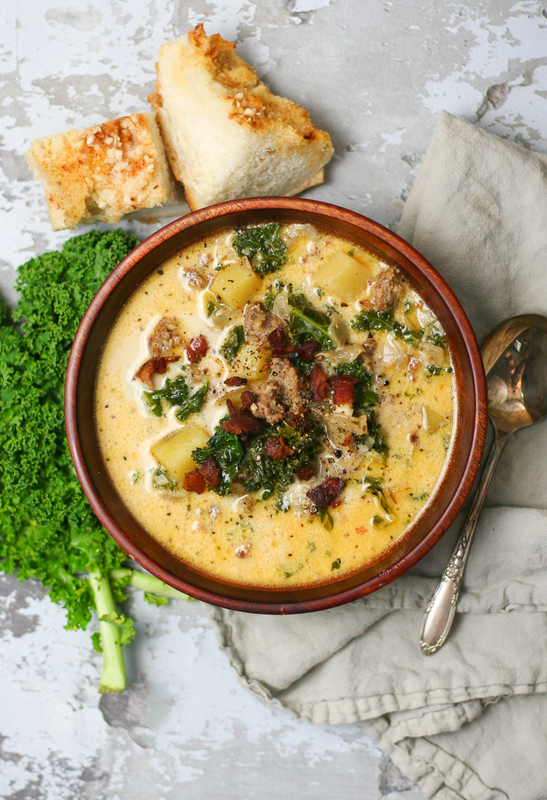 Turn off the heat and ladle the soup into serving bowls. Sprinkle with the crispy bacon bits and season each bowl with a sprinkle of salt & freshly ground black pepper. Enjoy!